The team at Achievement Products asked our consultant, Occupational Therapist Scott Russo, to provide some activity suggestions for incorporating some of our favorite items into daily classroom activities or curriculum. Scott has provided some really great and creative ways to use items (that may have been originally designed for typically developing children), in special needs environments. Today we will look at the Balancing Hat. The balance hat is a fun way to work on body awareness, gross and fine motor control, social skills and pre-academic skills. The lightweight foam pieces provide comfort when it is worn as a hat, safety if/when it is dropped, and ease of use due to the light-weight and easy grip material. The different colored and sized pieces allow for a wide range of pre=academic categorization options. Simple stacking activities. 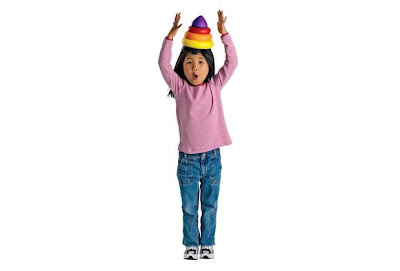 Have the child use the "hat" as a simple stacking activitiy without putting it on his/her head. Discuss the sizes, shapes and colors of the blocks while the child familiarizes his/herself with the "hat". Have the child stack the blocks on their head while standing still. Place the blocks on a surface that allows the child to be able to reach the blocks without bending, and stack the blocks in the correct order. Doing this activity in front of a mirror can help the child with poor body or spatial awareness and can also assist the child in finding the correct order with the visual clues seen in the mirror. Increase the stacking challenge and the motor coordination of the child, by having the pieces positioned on surfaces of different heights that require the child to reach up, bend down, and stack the blocks all without the tower spilling. Introduce balance into the activity by placing the pieces on different surfaces around the room, then have the child move from place to place, putting each piece on their head without spilling the tower. For group or individual play, complete a relay race. Separate the pieces so that child must walk back and forth between two surfaces to achieve the correct order of the stacking. If working in teams, each player must pass the hat successively to the next for the placement of the next piece. Other relay ideas: the teams must first work together to create the stack in the correct order on the table. Then each team member takes a turn wearing the hat while walking a fixed distance. The hat must be passed between teams members as a baton would be n a relay race. Bạn đang tìm nơi order hàng mỹ. Bạn đang cần mua hàng ebay tại việt nam. Nếu là như vậy hãy đến với chúng tôi. Bởi vì chúng tôi chuyên nhận vận chuyển hàng từ nước ngoài về Việt Nam và ngược lại. Các dịch vụ tiêu biểu của chúng tôi có thể kể đến như chuyển hàng đi úc, chuyển hàng đi mỹ, gửi hàng đi nhật bản, ship hàng nga về việt nam, vận chuyển hàng đi canada, nhận order hàng đức, gửi hàng đi lào, chuyển hàng đi campuchia, nhập khẩu hàng hóa từ nhật bản,... Còn vô số các dịch vụ vận chuyển khác đang chờ đợi bạn. Khi bạn cần vận chuyển chỉ cần liên hệ chúng tôi.